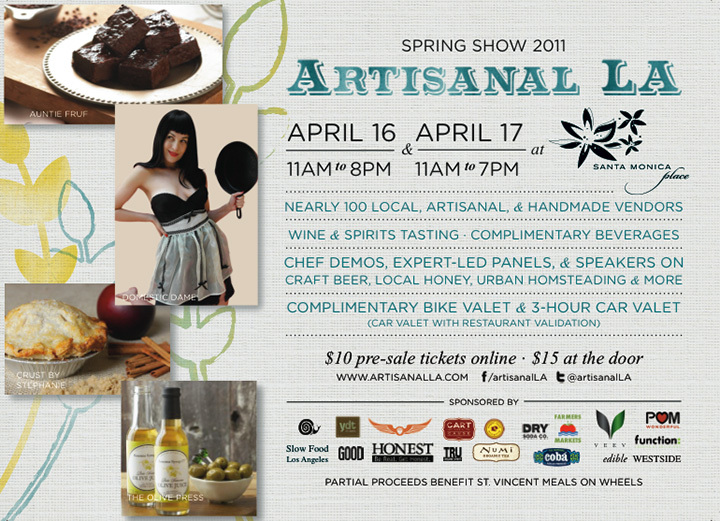 This weekend, Artisanal LA returns for the spring edition of its two-day showcase of the city’s finest local, sustainable and handmade edibles. Following on its Fall 2010 event (with an estimated 5,000 attendees), the community shopping, tasting, and learning experience heads to the Westside for the first time. The Artisanal LA Spring Show 2011 will take place on April 16th and 17th in a vacant department store off the Level 3 Dining Deck at Santa Monica Place, which will be transformed into a 50,000 square foot indoor venue with ocean views. With the new digs comes an expected attendance of 7,000 to 10,000 over the weekend. Attendees will be able to shop from nearly one hundred local, artisanal and handmade food vendors, including dozens of new purveyors, with more participants added to the Spring Show roster every day. Besides the dizzying array of shopping options, Artisanal LA will also present a variety of demos, panels and hands-on workshops. Cocktail enthusiasts should block off some time on Saturday at 1pm, when Matt Biancaniello (Library Bar) presents his Market Fresh Cocktails demo. At noon on Sunday, Melkon Khosrovian (Greenbar Collective) will speak about The Importance of Organic & Sustainable Spirits. Then at 3pm, Eagle Rock Brewery and Nibble Bit Tabby Brewery will present a Local Craft Beer Panel. Non-boozy demos and panels include author Ani Phyo signing her book Ani’s Raw Food Asia and an Intelligentsia Coffee demo and tasting.